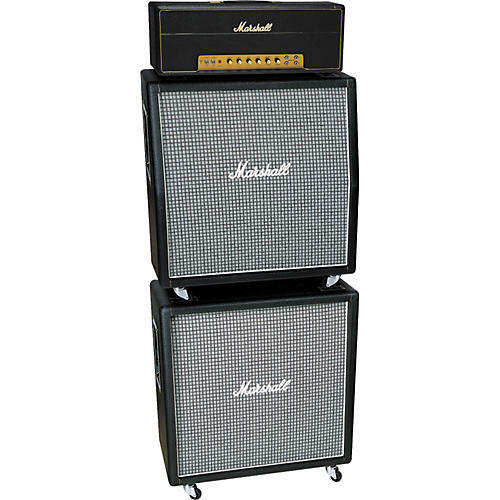 The 100W Marshall Plexi Full Stack includes a 1959SLP Vintage Series Tube Head and 1960AX and 1960BX 4x12 guitar extension speaker cabinets that play loud and proud. The all-tube Marshall 1959SLP tone machine cranks out fabulous lead distortion and tight crunch exactly like the original tube head from the '67-'69 era. Inspired by Pete Townshend's unquenchable thirst for VOLUME, the 1959SLP amp head delivers 100W of power from 4 EL34s and 3 ECC83 tubes in the preamp-the exact configuration of the original. The Marshall Plexi 1959SLP tube head also offers a true bypass series FX loop, 3-band EQ, and Presence control. The 100W Marshall 1960X speaker cab has 4 separate birch ply enclosures, each loaded with a Celestion G12M Greenback 12" speaker. Tonally the guitar cabinet falls between the Marshall 1960A's brightness and the Marshall 1960TV's warmth. Celestion Greenback G12M speakers have a very distinctive sound with fast, snappy response that adds detail and dynamics to both clean and distorted playing. The 1960X Extension Cabinet is dressed in the early '70s LC checkered grille cloth and a less-textured vinyl covering. If used as a half stack with a 100W head, a power brake is recommended.